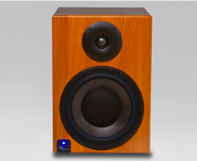 KS Digital ADM30 Studio Speakers... linear phase reproduction using DMC Dynamic Membrane Control. The latest KS Digital breakthrough, DMC, is featured in the new ADM30 active nearfield monitor. In order to lower distortion and provide perfect phase response, DMC controls the movement of the woofer with zero latency. It compares the input signal to the physical dynamics of the woofer, controlling its movement so the response is matched exactly to what's fed into it. The result is that the speaker reacts exactly as it should, no more or no less, giving you a distortion-free, perfect representation of your music. No other studio speakers on earth can promise such accuracy--this is a truly innovative approach to sound reproduction. The ADM30 is a self-powered 2-way powerhouse with stunning detail. Equipped with a DMC-controlled 8" speaker with a carbon-fiber membrane and special 1" tweeter specifically designed for this speaker, the ADM30 is faithful to KS Digital's philosophy of absolutely accurate impulse fidelity with the lowest level of distortion. 170W and 100W amplifiers drive the signal, with the DMC sensors controlling the woofer for perfect reproduction of your input signal. Compare these to any competitor's studio speakers and you'll be amazed at what they reveal... all the sonic details you've been missing this entire time, masked by distortion, poor phase accuracy, and muddiness in the low frequencies. And, like all our studio monitor loudspeakers, the ADM30 is magnetically shielded so it can be used next to your computer monitor. 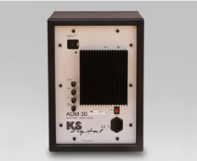 The KS Digital ADM30 is accuracy defined. The fast-acting MOSFET power amplifiers are mounted on the back of the speaker, as well as an XLR input, volume control, bass level control, high frequency level control, low cut frequency control, IEC power, and on/off switch. With the precision and accuracy of the ADM30, be prepared to hear sonic details you never thought possible! As with all our studio speakers, the KS Digital ADM30 is hand-built in Germany for you and comes with a signed Certificate of Authenticity, as well as a full 2-year warranty. ...I unpacked and setup the KS Audio AD30's and immediately noticed how transparent these monitors are. Every frequency has it's own space but what impressed me more than anything was, in that transparency, was a depth perception in the mix that I hadn't heard before. The resonance from the kick drum was in it's perfect frequency range, yet it was back - in the kit. When the beater hit the kick drum, i could actually feel the air pressure in the "z" plane (depth). It's rare to find speakers with great head room and transparency which lends itself to less ear fatigue and more hours of accurate aural perception. Yet this added dimension, I have never felt or experienced before. Not M-Audio, not Yamaha, not Tannoy, not KRK, not ADAM, and not DynAudio. Whew, now I can relax. I actually look forward to mixing the soundtrack CD for my documentary. The old wall of sound is now in 3D. These speakers are the Avatar of the speaker world. … By principle, uncontrolled speaker systems suffer with distorted impulse reproduction. To optimize this, the ADM30 features intelligent digital technology that rewards the listener with uncolored sound. ... This completely new approach of controlled membrane action establishes the ADM30, without any doubt, in the upper class sound-wise. Consequently, they are recommended without any reservations for all studios. … The ADM30 may appear as a conventional near-field monitor. In fact, hidden inside are highly technical electronics, which supply a linear frequency response in volume and phase in the sub and low-mids. … The stereo image is wide and separate from the speakers, at the same time open and dynamic. … The sub is as tight as you want it to be, well contoured and dynamic all the way down. In comparison to many competitors, the sub range is not so dominant and in your face. 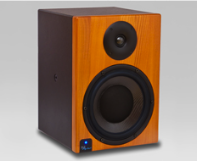 … Due to its well-balanced frequency response, the ADM30 is recommended as a real tool for studio applications. … The new ADM30 is a very well made studio monitor, which wins first prize due to its excellent audio presentation as well as its dynamic reproduction—which is consistent even at high volumes. The innovative DMC technology gives innovation to the low frequency reproduction, which has remarkable depth, clarity, and frequency stability—some people may not be used to such accuracy! ... For its size, the ADM30 supplies insane low sub frequencies... in the listening test, the ADM30 playback was instantly convincing through its dynamic reproduction and frequency response, despite its compact dimensions. … The ADM30 features full control of the low frequency driver with DMC, which gives the impression of a unit much bigger in size when listening or measuring. This enables the ADM30 to provide a powerful listening experience without a subwoofer, or even more distant listening environments in stereo or surround sound set-ups. Dimensions H 37 x W 26.5 x D 29 cm, 14.5" x 11" x 11.5"